Copyright ©2005 Anglo Press Lda. Paul Allen-Luckman            largest irrigators’ association has warned. Postal Address:                     drought, there was an increase in  and avocados. Urb.Lagoa Sol • Lote 3 r/c    The eastern Algarve, between Faro and Vila  more watering in time”, he explained. Plan, which covers the municipalities of  their farms but cannot”. 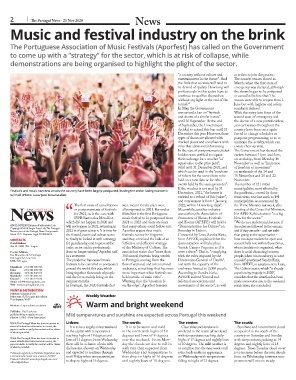 PRINT & DISTRIBUTION          difficulties” if Portugal experiences another  stream. 19,253 copies this edition    Nascimento recalled that last May it “rained  dam was essential and indispensable”. Publisher:                    The dams currently have “reasonable levels”,  farmers. ensure the irrigation year. guarantee a normal year of watering. Sónia Seixas                  difficulties if it is a dry year”, he warned. Association of Irrigation and Beneficiaries of  expected at this time of year”. Publicação registada na Entidade  number of owners who want to adhere to the  earlier on in the year. consumer”. editorialguidelines           used, agriculture has in fact been developing  end of May” he said, adding that last month  consumer”, he concluded.